On Sale Now: A new video version of this course you can do whenever you have time! This course normally costs US $35 but for a limited time, you can get it for $20! Just use the special Udemy coupon link below. Contrary to popular belief, a “sense of humor” is not a magical “gift” a few special people are born with. Humor and writing are skills anyone can develop. 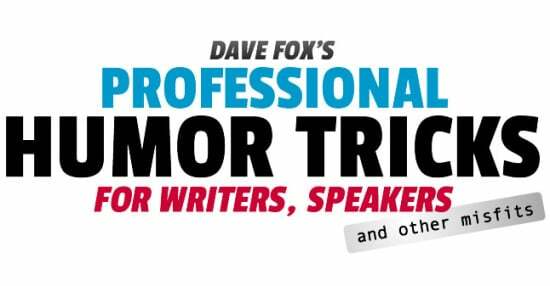 In this online workshop, award-winning humorist and bestselling author Dave Fox teaches you how! Discover the techniques professional comedy writers use to write consistently funny material. You’ll learn how to think, write, and be funnier. Each lesson includes specific techniques and exercises to incite maximum laughs. We’ll focus on writing humor columns, personal essays, and creative non-fiction. The skills you learn can be applied to humor of all sorts: stand-up and sketch comedy, cartooning, script writing, and more. And maybe full-blown comedy isn’t your goal. Perhaps you want to take more serious forms of writing — fiction, feature articles, blog posts, travel writing, children’s stories, personal memoirs … even office memos, cover letters, or personal ads — and sprinkle in some giggles. Whatever genres you write in, this class will infuse more laughter into your work. These techniques also work wonderfully for public speakers. Your audiences will remain awake, alert, and free of boredom-induced drool. So if your Inner Censor has been grumbling that you don’t have enough time or money to become a wildly funny, super brilliant writer and/or speaker, put a muzzle on that sucker! Come join us in this fun and inspiring workshop, and stretch your comedic potential to ridiculous new levels! Former Students: If you’ve taken the previous version of my online humor writing class, you are eligible to receive the new Udemy video version for free! E-mail me for details! The new video version of this course costs $35, but sign up now using this special link and you can get it for just $20! As more materials are added , the price will increase, so sign up today while you can still get this special discount for Globejotting.com visitors! More than three hours of fun and informative video lessons you can watch on your computer or the Udemy phone app. These lessons are specially designed for busy people — broken into bite-sized, coffee-break-length segments of three to fifteen minutes. You can watch the lessons whenever you want, as often as you like, and work through the course at your own pace. Writing exercises at the end of each section for hands-on practice. Lifetime access to our online forums where you can ask questions at any time and share your stories for peer feedback. Goose-bumpy satisfaction as your humor skills soar! A list of resources to help you further with your humor writing endeavors. A PDF e-book with all of Dave’s humor columns referenced in the lessons. For each critique, you can submit a humor column or story of up to 800 words. Dave spends roughly an hour per critique offering pinpointed tips to make your stories sparkle. He’ll help you harness your strengths, identify and fix your weaknesses, and develop your unique writing voice. He doesn’t just fine-tune the stories you submit; he focuses his advice to help you become a higher-caliber writer and humorist overall. You’ll share your stories in a special area of the online forums. Dave will offer detailed, paragraph-by-paragraph suggestions. Your fellow students will also be able to share their thoughts, so along with Dave’s experienced guidance (and twisted mind), you’ll have a team of aspiring humorists helping you become the best writer you can be. With the five-critique package, you can submit one story per section (excluding section one, which has a different type of writing exercise). Once you’ve completed the course, if you like, you can purchase additional critiques and keep polishing your skills. You can submit your five stories whenever you like (maximum one story per week) at any time within 12 months of purchasing the course. This basic course costs $35, but you can sign up here for just $20! Introductory price: Get your first critique for just $50. Please e-mail Dave if you’re interested in purchasing a critique package. He also offers general writing and humor coaching by phone and Skype (and in person if you happen to be in the same place as him — he currently lives in Ho Chi Minh City, Vietnam, but travels to other places a lot too). Please e-mail Dave to schedule an appointment. Ready to dive in? Hooray! Just follow this link and you’ll get instant access at a super-low price. You can start right away and learn how stretch your Silly Putty in ways you never knew were possible! Got questions? The above link will take you to the full course description on Udemy.com, where you can watch a couple of the lessons for free to be sure this is what you’re looking for. If there are any questions you don’t find answered there, drop Dave an e-mail and he’ll be happy to help you. Online Writing Course: "Travel Journaling: How to Write Extraordinary Travel Diaries"